My first coffee was instant. Some kind of mix from a can with the sugar and creamer all mixed in. I can’t remember when I tried it, but I could not have been much older than 10 or 11. I think it liked it, but who wouldn’t with all that cream and sugar? 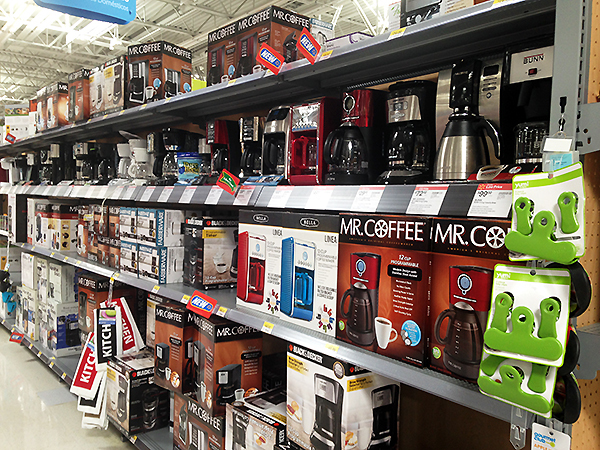 The aisle in my local Walmart where I found the Mr. Coffee® 10-cup Optimal Brew™ Thermal Coffee Maker. As I got older I still drank my coffee with creamer and sugar, I liked it pretty sweet. But life and tastes change and one day the powdered cream I always loved didn’t taste very good anymore. I think I was spoiled by the now popular coffee shops that always serve ½ and ½. At this point I would have coffee with nothing else but that. And one day I just tried it without sugar, just a taste. It wasn’t so bad. But it wasn’t dessert anymore. 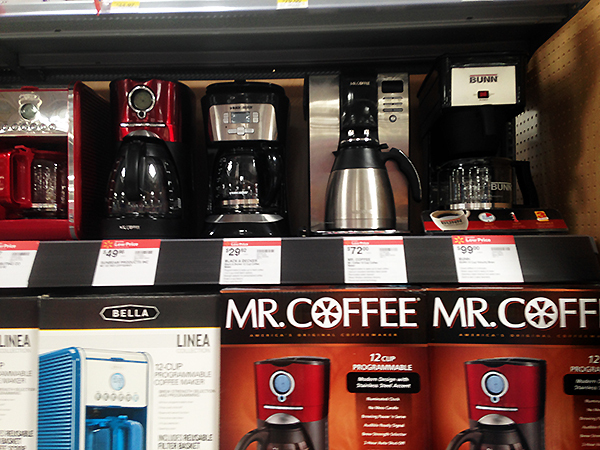 Isn’t the Mr. Coffee® 10-cup Optimal Brew™ Thermal Coffee Maker pretty? I was OK with that, I actually kind of liked it. My mom thought I was nuts. The next step of my coffee journey? Black. Here’s to change. #CoffeeJourneys #CollectiveBias You can see my 15 second video on Instagram right here. Pour a cup of coffee while the coffeemaker is still brewing using the Pause n’ Serve feature. 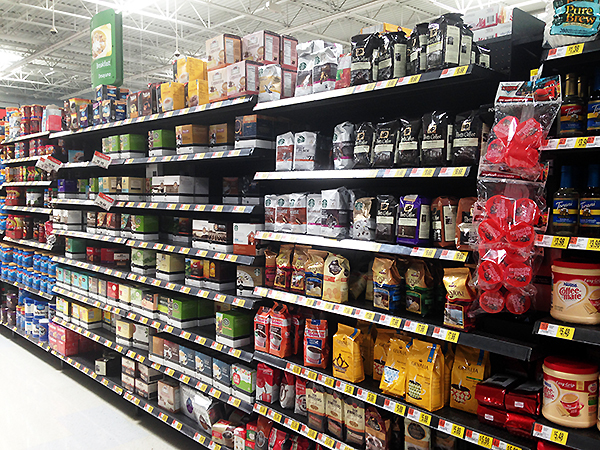 A variety of Millstone® coffee roasts and flavors are sold at Walmart, including, Hazelnut Cream, Hazelnut Cream Decaf and Kona Blend. Talk about YUM! Find out more about The Journey of the Bean here (it’s pretty cool). 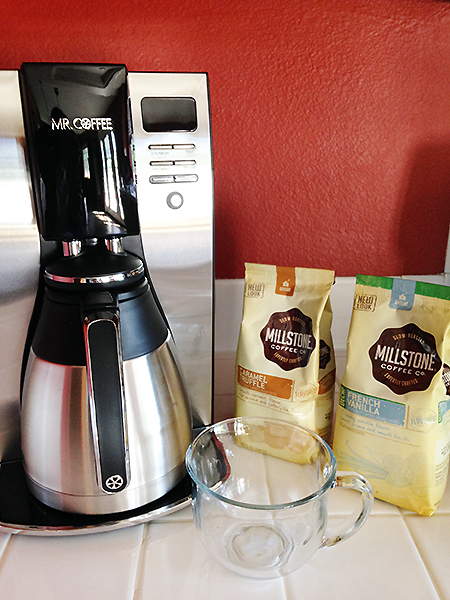 Frugal Living Mom is giving away a Mr. Coffee® 10-cup Optimal Brew™ Thermal Coffee Maker and a bag of Millstone® coffee to one lucky winner! 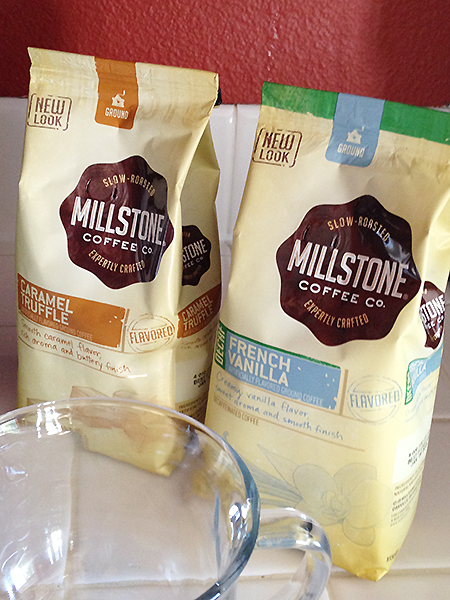 Win: Mr. Coffee® Optimal Brew™ 10-Cup Thermal Coffee Maker & 1 bag of Millstone® coffee. 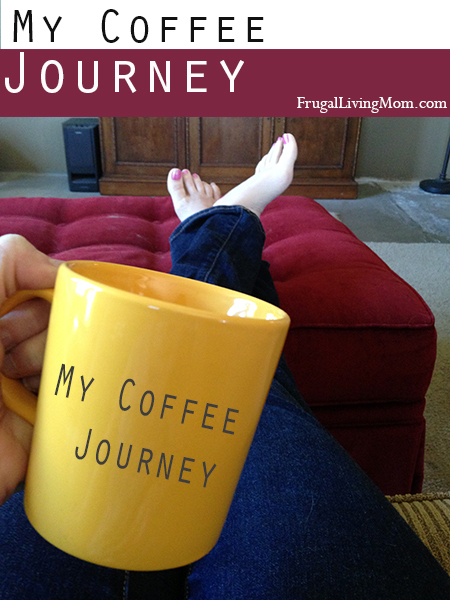 My Coffee Journey started when I was 15 or 16 and it was Folgers Instant! I Wake Up to Folgers brewed every morning! I drink coffee from time to time but I do not like adding sugar to my coffee. I love Flavored Coffee and if we do not have that in the house then I add just a little bit of Flavored Coffee Creamer to my Coffee. My Husband on the other hand loves Coffee with Sugar and Hazel-Nut Coffee Creamer. We drink alot of coffee in this house. Believe it of not, I just started drinking coffee maybe 5 years ago. I have been trying every coffee under the sun. I am a huge coffee lover! I only take my coffee very hot and black. I usually have 2-2.5 cups every morning. Coffee is my energizer and my drink to enjoy with the hubs!! I drank coffee for a while in my 20's, then Diet Coke came out and I drank that until a year ago when I started drinking coffee again. I like it with vanilla creamer. coffee cant live without it. My hubby got me into good coffee years ago and now I just love it. Give me coffee or give me death. I started drinking coffee when I got my first job and I need a cup every morning. I love coffee and drink tons of it...all kinds! 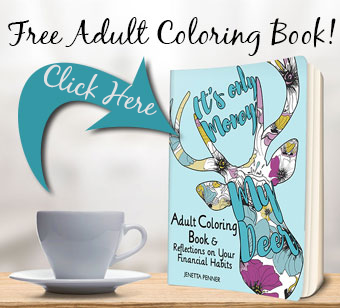 My coffee maker broke so this is an excellent giveaway for me! My journey began when I would be working through the day and never getting a chance to eat~so I started drinking coffee to take away my hunger pangs.Many years ago as a hair designer~now I drink it every morning to get the day going. My #CoffeeJourney started many years ago. I get up really early for work, around 3:00 am. I start out the day with a nice hot cup of coffee every morning. I drink a light roasted or medium roasted coffee with a little sugar and milk. Without my coffee, I would be lost. Hi! My coffee journey starts with coffee I've brewed the night before and chilled in the refrigerator. Then I add cream and coffee, sit in my recliner, and drink my coffee while looking over my email and reading blogs. Fun! Thank-you! My family and friends tease me because I drink coffee morning, noon and night no matter the season. I'm a regular coffee drinker with creamer and sugar. My coffee journey starts when I wake up. I usually have a cup while im checking my email and doing things around my home office. Sometimes I even enjoy a cup on my patio in the morning. I love my coffee with French Vanilla creamer! Coffee is just something for me to look forward to in the morning! My coffee journey began when I was a little kid, thanks to my old school Louisiana grandmother. I love coffee throughout the day. I like to drink coffee iced with creamer (flavored). I'm a coffee fanatic. I started drinking coffee when I was in college. I always have coffee first thing in the morning. I like to have a cup of coffee or tea after dinner. I'm a new coffee drinker. When I was young I always said that drinking coffee was for old grandmas, but I recently gave it a try and now I'm hooked. I love coffee. My coffee journey began when i was in university, so I am fairly new. I love having one cup each morning and love it black! I've been drinking coffee a few years...good ol' folgers in my standard coffee pot. One cup a day with ripped protein cream. I have been drinking coffee for many years. Years ago coffee was just something to drink with breakfast. Now that I am older I enjoy coffee in the morning and sometimes when it is cold I drink coffee in the evening. My husband has been a coffee drinker since we met 20 years ago, I just recently had my first cup and enjoyed it. We've been using an older brewer, but it's about to give out. Been shopping around, but haven't found one we like and can afford as of yet. My mother and brother are the coffee drinkers in the family, it didn't get that gene!! I drink coffee everyday before work. I started drinking coffee when I was in my 20's. I love to add a little hot chocolate to my coffee. It's my version of a homemade Mocha. I began drinking coffee when I was in the Army and on zero dark hundred missions/exercises and it continued to power me through grad school. I couldn't possible survive without at least 5 cups of coffee a day! Love all kinds and drink it black. I didn't start drinking coffee until my late 30's.....how did I survive?!?! I started drinking coffee when I started working many years ago. Gotta have my coffee lots of cream & sugar. Starbucks Gold Member! I love coffee everyday,sometimes more than once a day it's my energy elixir,with cream and sugar! I can't get enough of it! I started drinking coffee since about a year ago. Now I can't wait for summer to come so I could try cold brew! I have been drinking coffee - brewed, instant, gourmet, coffee shop, espresso, etc., etc. for 30 years (actually 29 years and 10 months and 3 weeks). These days I prefer black! If I can't taste the coffee, it isn't a good cup of coffee. I have been having panic attacks lately cuz my coffee maker broke and I have to make individual cups now and I miss smelling that fresh brewed coffee when I wake up. Would love to win this! I am not a coffee drinker. I would love to have a Mr. Coffee coffee pot for hot chocolate or tea. Or, I would give the coffee and Mr. Coffee as a gift. I love waking up to my coffee. It's a great start to my day. I starting drinking black coffee in my college day. Now I like my coffee flavored and with a flavored creamer and WITH SPLENDA. I started drinking coffee when I was working more than one job. I have been addicted since! My favorite way to drink coffee is hot and black and often. I started drinking coffee when I was 18 because I started working construction with my dad. We would stop every morning to get a cup of coffee at 6am. I drank it off and on since then but it became a true morning ritual once I started having to get up early and go to work for the school district in my mid twenties. I now have to have a cup every morning, it's part of my morning routine, and I just LOVE the taste of coffee!! We usually brew a pot of Maxwell House everyday. I never was a coffee drinker until I went to Europe and they all have a shot of espresso at a stand up bar on their way to work in the morning. I thought - "hey, that's a ritual I could get used to!" The first thing I do every morning is have coffee. I like it with lots of cream and sugar. I started out drinking black coffee. Now my favorite way to prepare a perfect cup of coffee is adding a dash of allspice to 2% milk and frothing it. Then I pour the coffee and frothed milk into the cup at the same time, stir and spoon a little froth on top. Delicious! I started out drinking those starbucks frappacinos from the deli in my college dorm. :) Yeah, I like to keep it classy. My taste has evolved from there. And now all I have to show for it is a broken coffee maker. :( Booo. I've always made my coffee with sugar and milk, usually 2%. I don't like 1/2 & 1/2 or cream or the powered stuff. The low calorie sweeteners taste artificial to me. I have a Mr. Coffee coffeemaker now that I got a year ago or so to replace a Cuisinart that eventually started leaking. The second pot of coffee I made the heating element only clicked and didn't heat so I called up customer service. They said that happens once in a while and they sent me a replacement right away and even upgraded it to a better model! I love good customer service! I don't drink coffee, but I am the coffee maker in our house. I love finding new coffees for my husband to try. We've even toured coffee plantations in Costa Rica. My coffee journey is from the coffee maker to the back patio, first thing in the morning! I have my first cup of coffee in the morning at 5 a.m. and one about every hour until 9 and I am set for the morning. My journey consists of 2 piping hot cups of coffee each morning to get me through the day. I love some coffee with just a splash of chocolate raspberry creamer. What a way to start and finish the day. Believe it or not, I started drinking coffee when I was pregnant with my second child. I would get up in the morning and prepare coffee and breakfast for her dad and the coffee just smelled so good. I began to crave it, so gave into my cravings and began drinking it. I started drinking it with sugar and powdered creamer, learned the delicious decadence of heavy cream in my coffee a few years later, grew older and realized that all that cream wasn't doing me any good, so switched to liquid creamer. Many years later, I still love my morning cuppa with sugar and creamer. 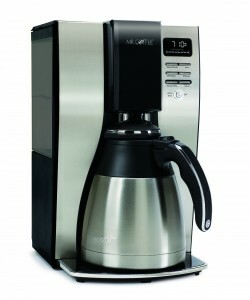 I would love to win this for my husband, who loves coffee. I have never had a cup of coffee myself! Coffee is what it takes for me to see the face of god. My coffee journey started a little over a year ago. I had gotten heavily addicted to energy drinks and started drinking coffee to get myself off the energy drinks. Now I don't really drink the energy drinks but I'm addicted to coffee. A few years ago we started buying whole bean coffee and grind it ourselves. Nothing can beat the flavor of fresh ground coffee. Only time I drink coffee is out with others and on a weekends. I look forward to my morning coffee each night before I go to bed! When morning does arrive, I love smelling the coffee as it brews - and I look forward to having a few minutes of quiet time to enjoy it - I am the first one awake in the mornings, and I find those few moments of peace really can set a good tone for the day. I currently have a nespresso but want to get back to normal coffee! I never go without caffeine in the morning. Thanks for the giveaway! I love being able to serve good fresh coffee to guests and/or myself and relax at home. Me and my wife drink coffee every morning and one before night time .. I love my coffee in the morning! My sister has worked for a coffee shop for the last 10 years and has kept us in beans. I started drinking a couple of cups a morning years ago and it's one of my favorite rewards in my day. I like a variety of coffee flavors - specially chosen for the occasion. I have been drinking coffee since I was twelve...I used to take it with sugar,milk and whipped cream...but now at 35 I take it with a little creamer. I can't drink as much as I want of it but I can have a cup or two a day. My family always had a pot going in my house...day and night. I keep it on throughout the day just like my grandparents and my mom. been drinking coffee since a teenager and then at 18 got a job at a coffee shop. While im making the kids breakfast before school i get my coffee brewing. perfect start to a morning! I've loved coffee forever. I can remember drinking coffee milk on Saturday mornings while watching Lost in Space with my dad. Been a part of my life ever since. I started drinking coffee 10 years ago when I went to a Bible Study. I think it was a requirement! :-) - I have loved it since. A morning just isn't a morning without Mr. Coffee getting started in the morning with a good strong cup of coffee. My mornings consist of coffee and creamer preferably French Vanilla. I will drink it throughout the day sometimes. I would love to give this to my mom!! She drinks coffee every morning! I started drinking coffee at my first real job where you worked hard in my 20's can't live without it now. I don't drink coffee...*gasp* I know! I have tried it multiple times even as an iced coffee from McDonald's and I just don't like it. My husband is the coffee drinker in our house. When we first got together, he really didnt drink it much and would play off how much he really wanted a coffee maker. I broke down a couple years later and got him one. Now sure when he tried/started drinking coffee, but I make his coffee every morning for him either black or more so with flavored creamers and sugar. It took me several years to get to drinking coffee with stevia. I started out with Latte's and Mocha's then switched to half milk half coffee then switched to coffee with cream and sugar. The best thing about waking up in the morning is smelling freshly brewed coffee to get me going. I have been a coffee lover for over 40 years. Mr. Coffee Optimal would be the best ever. I have seen these and have wanted one. My family loves coffee and this could be the ultimate ever! I actually don't drink coffee unless it's decaf and flavored with lots of whipped cream! But I'd love to win this as a gift. My first coffee was when I was 17 and spending 10 days with a Suisse family. The creamed coffee is stronger than any black coffee I've had in the states! LOL. So I've been hooked ever since. I prefer flavored coffee but will drink nonflavored, always caffeinated and with a dash of creamer. I didn't start drinking coffee until after college. When I was pregnant, I developed an aversion to coffee that (thankfully) went away after the baby was born. Now, I happily drink two cups a day! The first cup of coffee I ever drank was when I was 34. Hubby mixed some cocoa powder into it since I was a hot chocolate drinker. Than you for hosting the giveaway! I need to start a coffee journey, because I don't drink it now but feel like I need to start! I am all about the darkest roast out there! I love Sumatra, Dark Magic, and a string Italian Roast! Thanks for the fabulous giveaway! My coffee journey started when I was 21 at college late nights and tons of studying! I have to have a cup of coffee every morning. Usually only one, but if I don't have it, I get a headache...so I make sure I have it! i love coffee but my favorite type is with powdered cream hands down! i could drink any type but that is my morning pick me up! thanks for the giveaway! I don't drink coffee all the time but when I do I love Iced coffee. My coffee journey started when I was a little girl. My Dad used to leave the last tiny sip of his coffee, sweet from the sugar that settled there. I've loved coffee ever since. My coffee journey has been mostly from my friends…they always seem to be introducing me to all new kinds & flavors! I have drank my coffee black for years.About a month ago i started adding creamer,now i have it that way every morning. I got hooked on coffee after beginning to work. That has been 20 years ago and now I have to have several cups throughout the day. Little cream and sugar in mine! I love my coffee with lots creamer. Nothing is better than coffee brewing. Reminds me of my childhood. I love coffee .I started drinking coffee when I was little with my father it was something that bought us closer. I love sneaking a sip of mom's coffee as a kid...though it didn't taste as good as it smelled! When I started drinking coffee myself, I discovered flavored coffees and have never looked back. Got to have my morning cup! My journey involves finding just the right K-cup to suit my need, as well as the best activity to go with sipping a nice hot, fresh cup of Joe! Look like a awesome coffee maker---and I never bought one but would love to have one---for those coffee moments! Thanks for opportunity! I want to win this so badly... I miss my old Coffee Maker. I used to drink a lot of vanilla lattes, but lately I've been liking my coffee black. My favorite drink is a decaf Americano. I used to drink more tea but now with 2 kids I'm enjoying the java a lot more! My coffee journey started when I was very young 7 or 8. My parents always drank coffee. 40 years later I can still remember the smell of coffee being brewed by my mom. Actually it was a percolater. I figured it had to be something good if my parents drank it all the time. So one time I got brave and snuck a cup and I hid and drank it. Yuck. It was not good. I never thought I would ever try coffee again. Boy was I wrong. I just waited till I was in college and now I'm hooked like my parents were. And now my parents barely drink coffee. I can not remember the first time I drank coffee. I have tried all kinds though from the flavored powdered coffee to fresh beans and now I just love strong black coffee! I drink serveral cups in the morning til around noon. My coffee journey started on graveyard shifts a the nursing home I worked at. I still love it black and luke warm! I drink brewed coffee almost everymorning. I love drinking it black extra hot on the go. I never used to drink coffee but now I need it every day! I used to only have coffee from coffee shops and the kind with a LOT of sugar! Not until a few years ago did I start brewing my own coffee and absolutely LOVE it now! I love coffee. It gets me woke up in the morning & there's so many different ways to taste it! I have drank coffee for 35 years! I started at age 9! My coffee journey begins with jumping into the shower for the morning wake up and sipping on coffee from then on for about 2 hours. By then, I am awake and ready to start the day. Then, on my way home from work, I usually swing by and pick up a speciality coffee for the ride home and second wind. My coffee journey started when I quit drinking soda a few years ago and needed a little motivation getting up in the morning. I would love to win for my mom! My coffee journey is on pause right now. My doctor says no coffee while pregnant. I have snuck in a sip or two though. Shhhhh! My coffee journey is a cup in the morning at at night! I don't like coffee as much as my husband. This would be for him since he loves coffee and drinks it all the time. My coffee journey is daily every morning! I love coffee and have a cup every morning when I wake up before getting the kids up for school! Thanks to my Grandma, she got me started and I never looked back! When I drink coffee I like it with a lot of cream in it. I get my first cup when I get to work. I've always had Mr. Coffee coffee pots but not like the Optimal Brew Thermal. I usually start a pot of coffee not long after I get up and let the dog out. Just the scent of the coffee helps motivate me to get my day started. I enjoy drinking a cup or two outside, in my kitchen or at my desk while reading. It's nice to have some me time doing what I want after waking up with a cup of coffee. Sometimes I will have more coffee later on in the day but I switch to decaf. My coffee journey begins at 4am each morning with my first cup. I then drink another cup when making sure everyone gets off to work or school. It then goes with me to my school where I teach and then to the teacher's lounge. I have a cup at lunch and then the journey ends when I have a final cup after dinner every night. Coffee is one of my best friends! I started drinking coffee when my youngest was 16 months old because I was making lots of long drives. I usually drink coffee on a daily basis and I like mine strong and black. I have always liked it that way.